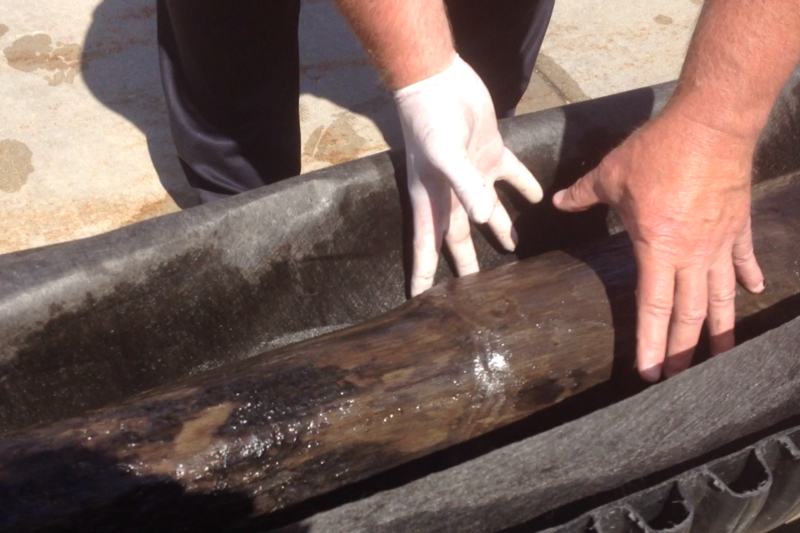 Archeologists studying a wooden beam pulled from northern Lake Michigan this summer can't say whether it is a piece of the first European ship to sail the upper Great Lakes or a post from an old fishing net. The group managing the project is close to issuing a report to the state archeologist, but it won’t reach any firm conclusion. Read on to discover the evidence that points to each conclusion. Steve Libert has looked long for the remains of a French ship, the Griffin. It was built by the explorer Robert de La Salle and was last seen in 1679 leaving Green Bay. In 2001, Libert found a wooden beam sticking out of the bottom of Lake Michigan not far off the southern tip of the Garden Peninsula, near Poverty Island. This summer, Libert’s team, Great Lakes Exploration, organized a test excavation of the site believing the hull of a ship was not far below the surface, buried by centuries of sand and sediment. Divers dug down along the base of the exposed beam and discovered it was not attached to anything. It came loose and was brought out of the lake. The archeologists he brought in to direct the excavation are now leaning towards the theory that the timber is a stake from a fishing net left in the lake some time after 1850. A team of French archeologists also examined the timber and they say it looks like the bowsprit of a ship from the era when La Salle was in North America. They issued a separate report last year. What’s the case for a bowsprit? Below is a diagram of another ship sailed by La Salle called the Belle. It sank in the Gulf of Mexico less than ten years after the Griffin was lost. Notice in the highlighted area the piece of wood extending diagonally from the prow at a slightly upward angle. That's the bowsprit. On the end of this beam is a vertical flagpole, without a flag. Look closely and you'll see a corner piece that connects the flagpole and the bowsprit. This elbow-shaped piece of wood is called a knee. That knee would have been attached to the bowsprit with wooden pegs like the ones sticking out of the beam discovered by GLX. The beveled end of the beam taken from Lake Michigan. 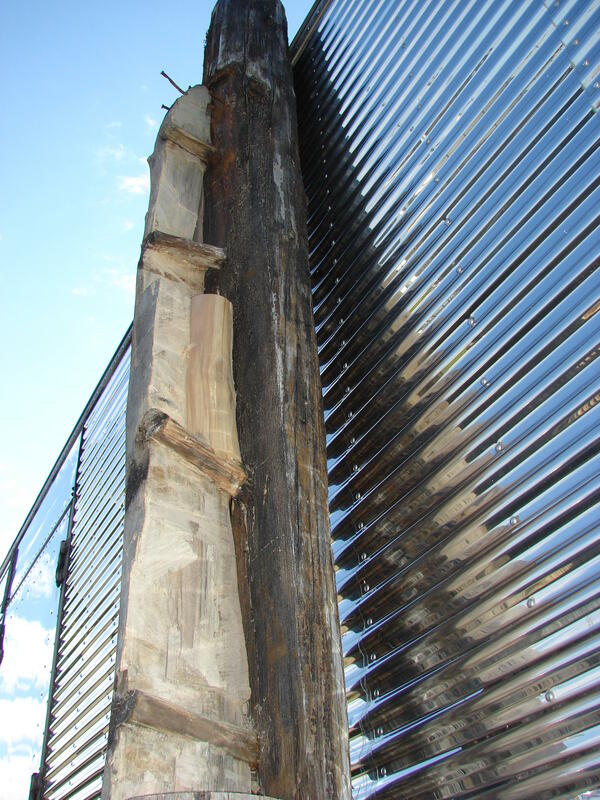 The other end of the beam (pictured right) is beveled in the way archeologists would expect if it had been designed to fit into the vertical mast of the ship inside the hull. 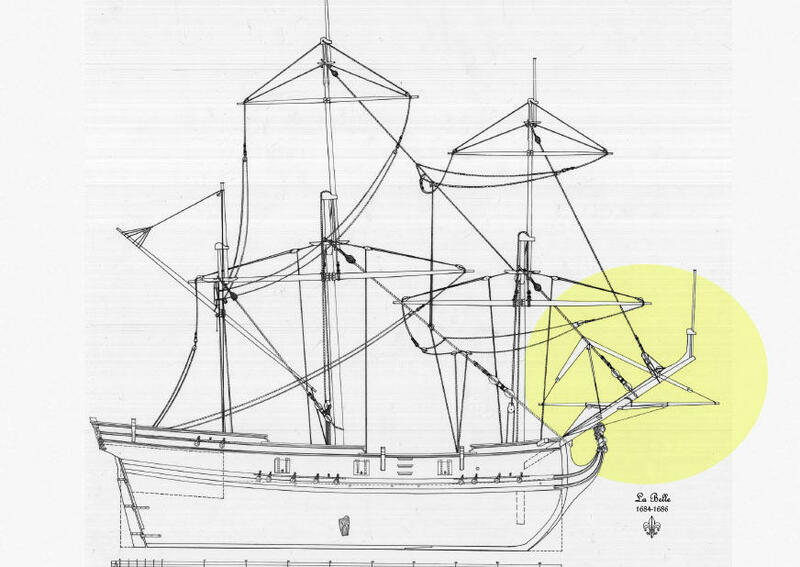 This is a critical piece of evidence in favor of the theory that the timber was a bowsprit. 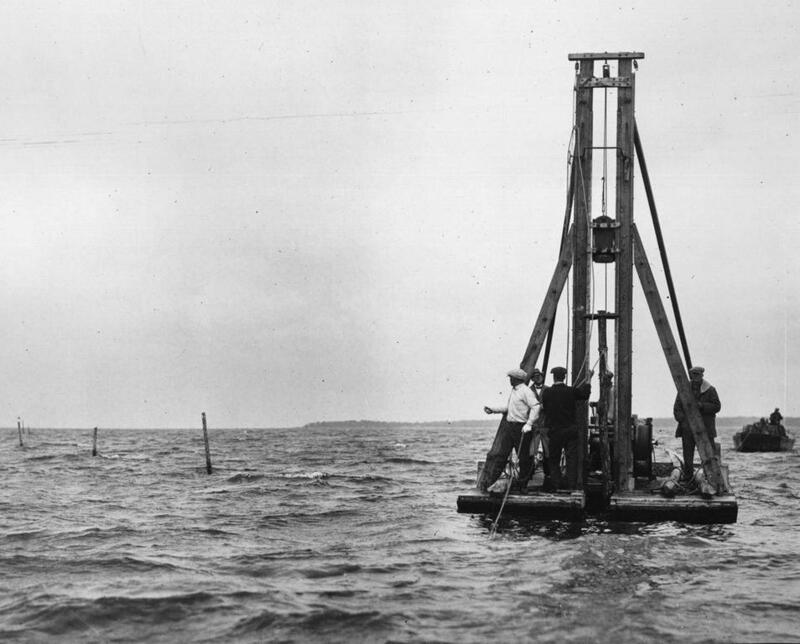 If it were a stake from a fishing net, one might expect that end to be sharpened, since fishermen had to drive the post into the lake bed from 50 feet above on the surface of the water. What’s the case for a pound net stake? Credit Bob Ruleau, Ruleau Bros. Inc. Above is a photograph of a barge used to drive pound net stakes. These nets, strung from timber to timber, came into use on the Great Lakes in the middle part of the 19th century and were often set at depths of 35 feet or more. 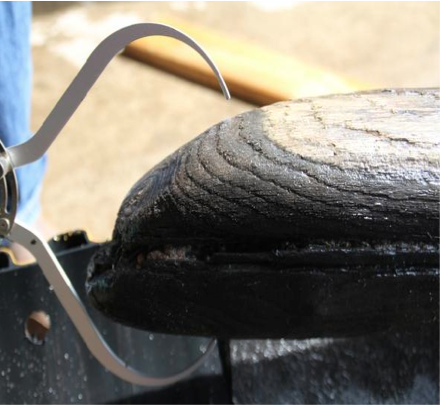 The gear was so effective, and widely used, it became controversial among even fishermen as stocks of whitefish, the most prized commercial fish in the lakes, began to decline. The pound net stake pulled from Green Bay by Bob Ruleau. One timber has been split to expose the wooden pegs holding the splice together. The idea that the beam found near Poverty Island by GLX could be a pound net stake was implausible, at first. No one involved in the project knew of pound net stakes that had been made from multiple pieces of timber spliced together with wooden pegs. This summer, Bob Ruleau, a fisherman from Wisconsin got in touch with GLX and provided photographs of a pound net stake he had picked up in a trawl net. Ruleau’s family has been fishing in Green Bay since the 1800s, and he says there are hundreds of pound net stakes left out in the lake and many were made of multiple pieces of timber spliced together. “The splices are exactly the same,” says Ruleau of the timber he found and the one GLX brought up this summer. There is also a piece of evidence mentioned in the French report that seems to weigh in favor of the pound net stake theory. The beam found by GLX has an erosion ring at about the line where the lower section of the beam was buried in the mud. The section of timber exposed to the water had worn down over time. The single erosion ring on the beam found by GLX. The French report points out this single erosion ring suggests the beam was buried rapidly. "If the artifact had undergone a gradual burial process," the report explains, "or one comprising a series of more or less rapid phases, whether regular or irregular, it is probable that several erosion rings would be visible." 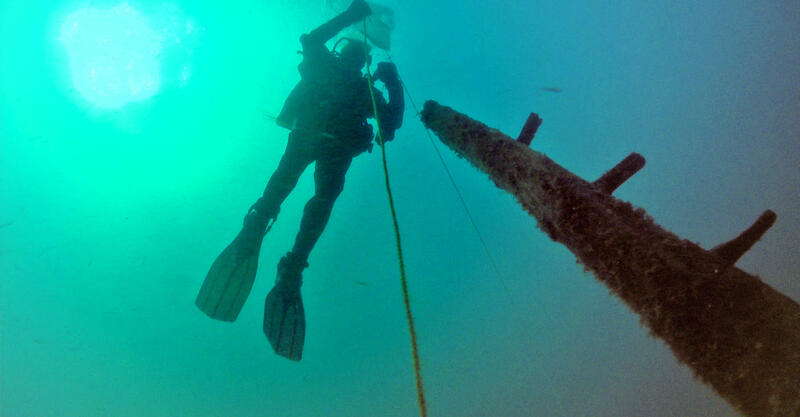 The French report does not offer a theory for how a bowsprit from a wrecked ship could have been rapidly buried in the bottom of Lake Michigan. That depends on Steve Libert. The information available will help guide whatever next steps he takes. Libert recently retired to Charlevoix from his home in Virginia and career as an intelligence analyst with the federal government. Great Lakes Exploration has been looking for the Griffin for more than 30 years. In recent years, he and another member of the original group have been limited in their ability to dive because of health issues. Libert is steadfast and says he has "no doubt that the architectural timber is that of a ship." He plans to be back at the location this summer searching for the remains of the Griffin. A legal battle over what might be the most historic shipwreck in the Great Lakes is over, for now. That means further exploration of a site in Lake Michigan could pick up again. About a decade ago, a shipwreck hunter working out of the Garden Peninsula in the Upper Peninsula found what he says might be the Griffin. The ship owned by French explorer Robert de La Salle disappeared in 1679, but a legal battle involving the State of Michigan and the French government ensued that has slowed attempts to identify whatever he found. The State of Michigan archaeologist says there does not appear to be a vessel buried where underwater explorers had hoped to uncover a 17th century shipwreck this week in northern Lake Michigan. Explorers have been looking for the wreck of the Griffin off the coast of the Upper Peninsula’s Garden Peninsula. State Archaeologist Dean Anderson says two things originally drew explorers to the site: acoustical surveys of what appeared to be a ship buried in mud, and a beam of wood sticking up into the water.